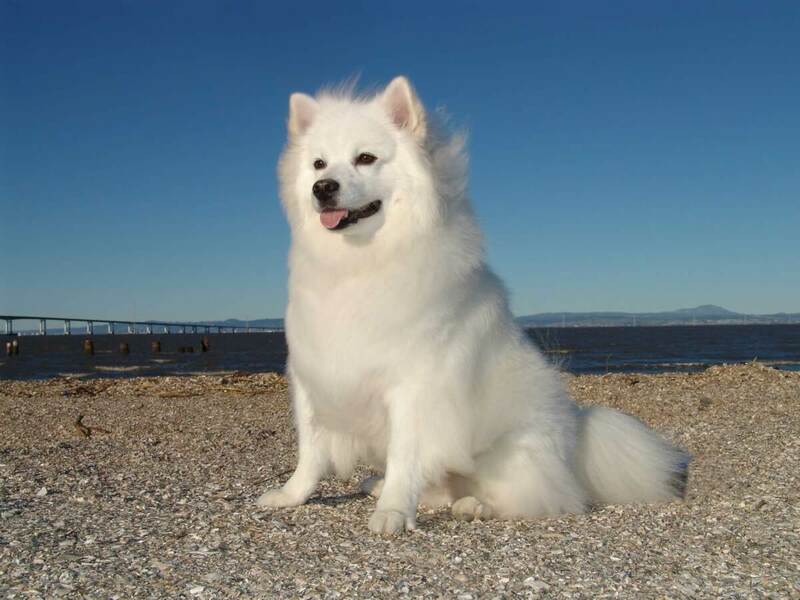 The American Eskimo dog is a toy to small sized dog breed known for their fluffy white coat and cheerful personality. The breed excels as companion dogs for families as they enjoy entertaining and love receiving attention. They are considered to be one of the most intelligent dog breeds and are very agile-- which helped them in their previous roles as circus performers! They are easily trained, adaptable to many living environments and very companionable. Eskies are also high maintenance in regards to grooming and need moderate amounts of daily exercise. 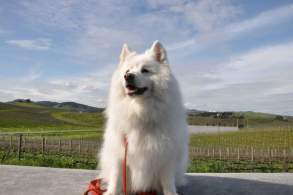 American Eskimo Dogs are members of the non sporting group within the AKC. Although they were brought over by German migrants to be farmdogs and watchdogs, they are now bred almost solely as companions. The are healthy, compact canines that come in three sizes: toy, mini and standard. These beauties are adaptable to almost any household as long as they can get enough outdoor exercise. They need owners that can spend plenty of time with them. Training should be a breeze so they make excellent choices for first time dog owners. Grooming their fluffy, luxurious coats may take quite a bit of time as several brushing sessions are recommended per week. 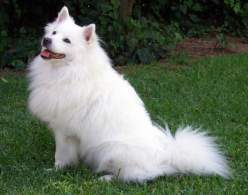 They are generally healthy with the oldest American Eskimo dogs living around 15 years! 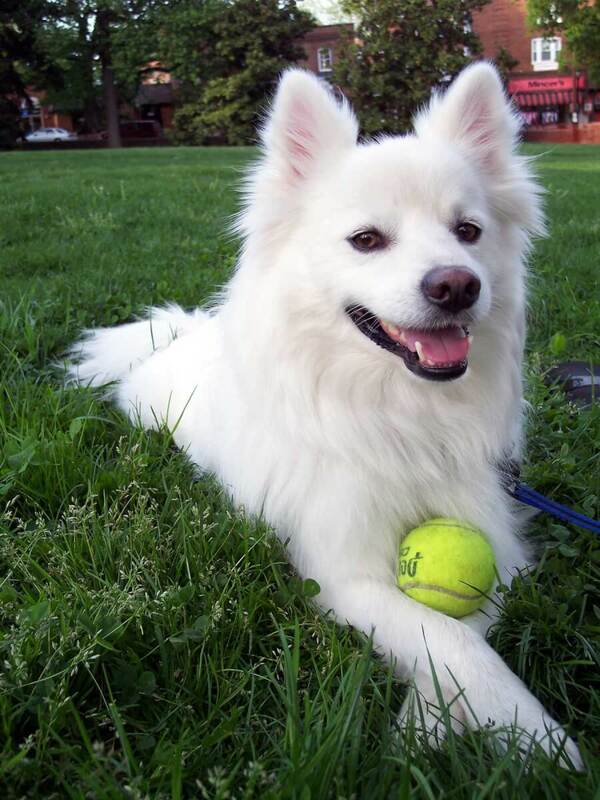 We've compiled a list of quick facts about the American Eskimo Dog for you. The American eskimo dog comes in three different sizes: toy, miniature, and standard. Toy eskies are 9-12 inches tall and weigh between 6-10 pounds, while standard American eskimo dogs are roughly twice the size. American eskimo dogs are an extremely intelligent dog breed, which can be good or bad depending on their living environment. Bored eskies will not stay bored for long and will quickly find ways to entertain themselves which can lead to destructive behavior. The breed is very friendly with both children and larger household pets, but will be suspicious of strangers. The American eskimo dog has a thick coat which is straight with no curl. The breed is nearly always white, but cream colored eskies can be found. Eskies are known to shed a lot and will require regular brushings and baths to keep their shedding under control (and not in your home). When the breed is not shedding (in colder weather) they will stay surprisingly clean without baths due to an thin oil coating on their fur. The American eskimo dog is a very energetic dog breed and will require large amounts of exercise to control their high levels of energy. The American Eskimo dog's origin has nothing to do with Eskimos-- or even America. During the 1800s Germans begun migrating to America's new frontier. Settlers were pushing westward and there was plenty of opportunity to be found in the farmland of what is today referred to as the Midwest. With the Germans came their German Spitz dogs; the Spitz is a certain type of dog that has a double coat, pointy muzzle and ears, and a curled tail. Many Spitz were employed as farm dogs, herder, property watchdogs and even sled pullers. During the late 1800s the breed began being utilized in circuses and other performing acts. They are very agile, super intelligent and ever so eager to please so this was truly a match for the personality of this northern Spitz-- not to mention the snow white coat is very beautiful and eye catching! They danced, did tricks and wowed the crowd with their keen intelligence. The most famous Eskie was named Pierre. Pierre was the first dog to walk a tightrope as part of Barnum and Bailey's circus around 1930. The German Spitz underwent a name change during Americas involvement in the World Wars. Due to anti German sentiment the new name became the American Eskimo Dog after the American Eskimo Kennel ran by F.M Hall and family. The American Eskimo Dog Club of America (AEDCA) was formed in 1985 with AKC recognition of the breed following 10 years later in 1995. It's important to note the breed in still known and registered as the German Spitz by most other Kennel Clubs around the world. An American Eskimo dog looks just like what you'd imagine a Spitz type dog to look like. So what does a Spitz dog look like? These breeds share many of the same characteristics such as a thick, double layered coat, and Spitz tail carried curled over the back. Overall, Eskies are compact small-medium sized dogs. As stated previously, the coat is thick and double layered, consisting of a short, dense undercoat and a long, straight outer coat. The color of the coat is always white or biscuit cream. There is an excess of hair around the neck which looks similar to a lion's mane but that on the muzzle and ears is short. The back of the legs are feathered and the tail is plumed They have pointed faces with small, triangular ears and the lips, nose and rims of the eyes are black. Characteristically, the American Eskimo dog's Spitz tail is carried curled over the back. The American Eskimo dog is white or biscuit cream-- always. Although there are many other Spitz dogs that are black, tan, golden, orange, brown this is not one of them. There are a few other breeds that resemble the AED so if you see what you think is a black American Eskimo dog, then it likely isn't; although they would look lovely with black coats, to be considered a registered purebred the coat must be white. Toy is the smallest size a purebred AED can be. 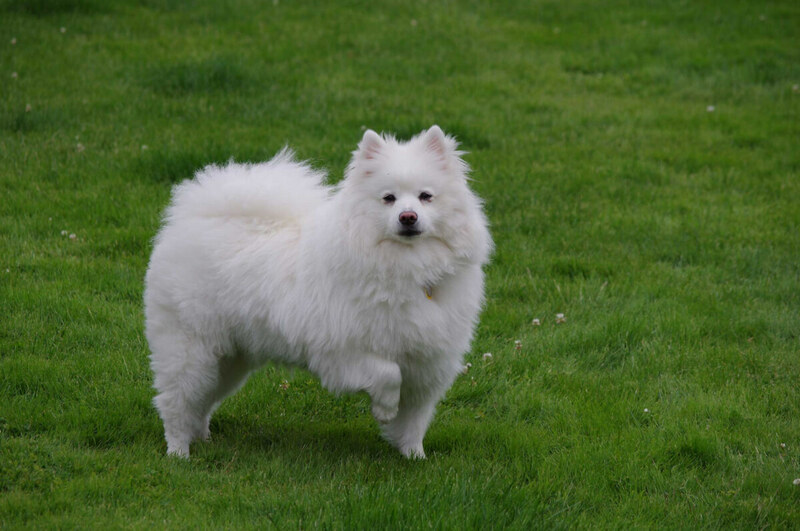 The toy American Eskimo dog's weight will be 6-10 pounds and height is 9-12 inches. Mini is the mid-sized version of the breed. The mini American Eskimo dog's height picks up where the toy left off at 12-15 inches. He/she will weigh 10-20 pounds. 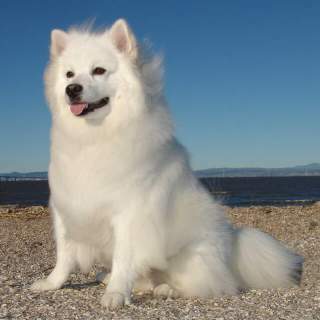 Standard is the largest size the Eskimo Spitz dog will be and it is still only considered medium-sized, overall. A fully grown American Eskimo dog in this category should reach 15-19 inches and weigh between 25-35 pounds. The American Eskimo is a Spitz type breed of dog that is considered standard in three sizes: the toy Eskimo Spitz, the mini and the standard. They differ only in size, regardless the features of the breed's appearance remain basically the same. The Miniature American Eskimo dog is considered the medium-sized variety, with the toy Eskimo Spitz being the most petit and the standard being the largest. You may see American Eskimo dog puppies advertised as teacup. This is not a size recognized by the AKC and they are not considered purebred for the purposes of registration, competition, etc. Breeding a dog's size down must be done very carefully and responsibly or serious health issues can result. 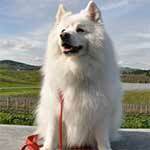 The American Eskimo Dog temperament is best described as playful, active, intelligent, loving and friendly. Not all Spitz type dogs have the personality or temperament of the American Eskimo-- they are as special as they are beautiful. They need plenty of attention and will love to be part of the family and participate in your daily routine. If not given enough attention and exercise they can be destructive and needy. Eskies do well with families with children and other pets; they were bred as companions, not working dogs, so they should even do well with non canine pets such as cats. Members of this breed regard strangers with a watchful eye until they warm up-- which is fairly quickly. It's important to train all dogs while in the puppy stage and this breed has an unusually long puppy period. The American Eskimo spitz will remain a puppy for up to two years! Luckily, training should be fairly easy for this breed. The American Eskimo dog's traits of being perky and very eager to please allow them to do well with many types of training- house training, obedience, agility, etc. Taking them on long daily walks is recommended and this friendly breed will also enjoy trips to the dog park. Not all dogs in the Spitz family are suitable for homes with children but the American Eskimo Dog is one of the ones that are! They are playful, loving and active so they will enjoy playing with kids they are familiar with. Eskies may be a little standoffish to kids they don't know, however, they are not shy so give them time to warm up and they certainly will. They are not aggressive dogs. 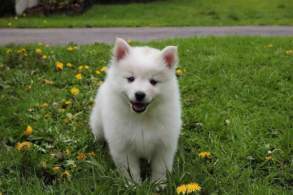 The breed is easily trained and eager to please so if you train your American Eskimo puppy early he/she should be excellent with children. Below are pictures of the American Eskimo Dog dog breed. The American Eskimo dog breed is very adaptable. They are good apartment dogs provided they get daily exercise. They do bark quite a bit and while this makes them great watchdogs your neighbors may not appreciate it very much. We recommend early training and socialization so your Eskie can distinguish between situations that call for barking. If you do notice your pet is excessively barking it could mean he/she isn't getting enough time with you or, more likely, exercise. Speaking of exercise, this breed could use a few long walks per day. They enjoy dog parks, hiking and some even like the beach! Eskie dogs excel in obedience and agility training as well as some sports and these are all excellent ways to exercise the body and mind. They are easy to train, even for a first time owner as they are naturally eager to please. The American Eskimo dog is not hypoallergenic. The thick, double coat must be brushed with constant vigilance to keep it free of mats and tangles. You may also want to wipe the tear stains with a wet cloth as needed-- these are breeding grounds for bacteria and yeast. While they are natural and common for Eskies you certainly don't want them to get eye infections.